"Carlo Sarrabezolles - sketch of the colossal"
192 pages, color illustrations, 29 x 25cm, hardcover. Tous les jours de 12 h à 19 h sauf dimanche, lundi et jours fériés. In Reims, Carlo Sarrabezolles is known for the decoration of the Town Hall, which he made in collaboration with his friend Roger Expert, and the exhibition focuses on this collaboration which also extended to the décor of the Normandie ocean liner and the French Embassy in Belgrade. The exhibition throws light on the era of Art Deco and the Art of the 1930s, which are so important in the city of Reims. It focuses above all on the artist's creative mark, his different studies and also on his invention of the technique of carving directly in concrete. 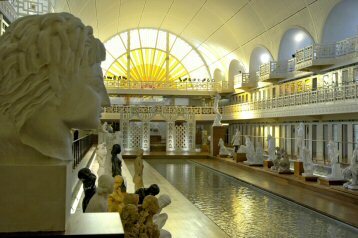 ‘La Piscine’ Musée d'Art et d'Industrie André Diligent – a museum built within a magnificent swimming pool in Roubaix – sees the opening of a traveling exhibition, lasting two years, which charts Sarrabezolles’ whole career. 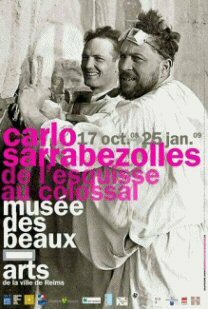 The exhibition will develop, according to a different theme at each venue, in museums in REIMS, PARIS, MONT-de-MARSAN, CHAMBÉRY. At ‘La Piscine’, The Genius of the Sea, conceived by the artist for the rear deck of the “Normandie” liner, will be the object of special focus, highlighting the monumental plaster head which has been part of the display at La Piscine since 2001. Art Deco from Reims to New York. Fifteen sculptures by Sarrabezolles who had, in 1928, decorated the interior of the Town Hall, constructed by R.H. Expert. Inauguration of the statue "L'Espérance" (the Hope)offered to the city of Paris by the SNECMA. 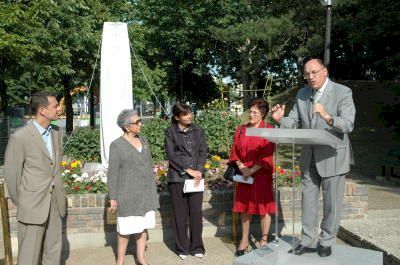 From left to right: Geneviève Appert-Sarrabezolles, fille du sculpteur; Anne Hidalgo, 1ère Adjointe au Maire de Paris; Jeanne Chabot, 1ère Adjointe au Maire du XV°; Jean-Paul Bechat, Président Directeur Général de SNECMA. Publication of new edition of Carlo Sarrabezolles book. 1931 "La gloire de la Seine"
"Carlo Sarrabezolles, sculptor and statue maker" (Carlo Sarrabezolles, sculpteur et statuaire). Catalogue of his work, index, biography, 192 pages, 240 illustrations, 28 x 25cm, hardback. Available in bookshops, Museum shops and by subscription. Co-published with éditions d'Art Somogy and sponsored by "Ciments CALCIA"